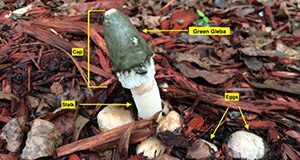 Stinkhorn mushrooms are commonly found in Florida home gardens and along the Gulf Coast, and are known for their offensive, rotting odor. 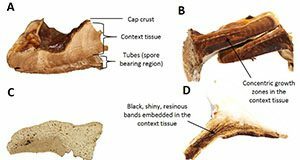 This 5-page document profiles the morphology, ecology, phenolology, toxicology, and treatment of this mushroom. Written by Eleanor Phillips, Jennifer L. Gillett-Kaufman, and Matthew E. Smith and published by the UF/IFAS Plant Pathology Department, December 2018. Ganoderma Karst. is a large and diverse genus of wood decay fungi that can rot the roots and/or lower trunk of many tree species. There are several laccate (varnished or polished) Ganoderma species that are found in the southeastern United States and this six-page fact sheet provides an overview of the different species. Written by Andrew L. Loyd, Jason A. Smith, Brantlee S. Richter, Robert A. Blanchette, and Matthew E. Smith and published by the Plant Pathology Department. 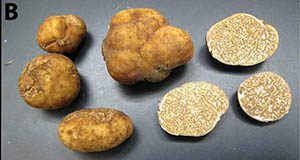 A truffle is a round, knobby, or lobed mushroom fruiting body that forms below ground. The “pecan truffle” (Tuber lyonii) is an edible truffle species, native to eastern North America. This fungus lives in a mutually beneficial relationship with the roots of some trees, including species of oak, hazelnut, and hickory trees, as well as the cultivated pecan tree. This four-page fact sheet describes the pecan truffle, its economic and culinary significance, morphology, and phenology and distribution. Written by Arthur C. Grupe II, Timothy Brenneman, Gregory Bonito, and Matthew E. Smith and published by the Plant Pathology Department. The “false parasol” or “green-spored parasol” mushroom (Chlorophyllum molybdites) is a poisonous mushroom that is the most common cause of mushroom poisoning in the United States. This mushroom is widely distributed throughout Florida and the southeastern United States. It commonly creates a complete or incomplete “fairy ring” in lawns, grassy areas, and open woods. When mature, the green-spored parasol mushroom has a large cap, a ring around its stem, and a greenish color on the underside of its gills. 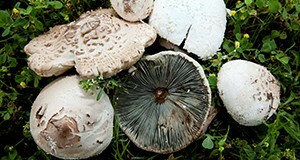 This four-page fact sheet describes the morphology, ecology, and distribution of the green-spored mushroom as well as its toxicology and how to treat poisoning from this mushroom. Written by Lisbeth Espinoza and Matthew E. Smith, and published by the Plant Pathology department.